State Reps. Woody Burton and John Young encourage students who want to learn more about state government to participate in the Indiana House Page Program during the 2019 legislative session. According to Young, those who are between the ages of 13 to 18 can spend a day at the Statehouse in Indianapolis helping staff and local legislators, touring government offices, and learning about the legislative process. Student pages receive an excused absence from school and groups can participate together. For more information and to sign up, visit www.indianahouserepublicans.com/pageprogram or call 800-382-9841. 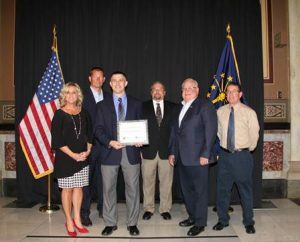 The Indiana Department of Education on Tuesday awarded Whiteland Community High School for student success on AP exams for the 2016-2017 school year, according to State Rep. Woody Burton. During the 2018 Indiana AP Recognition Ceremony, the DOE and College Board recognized more than 70 schools for having 25 percent or more of their graduating class earn a score of 3 out of 5 on at least one AP exam. Burton said high school students take AP exams after they complete courses designed to demonstrate they are prepared to handle college-level work. With a successful AP exam score, a student can usually earn college credit. AP exams are developed by the College Board, a mission-driven, not-for-profit organization that connects students to success and opportunity in higher education. State Rep. Woody Burton represents a portion of Johnson County. PHOTO CAPTION: State Rep. Woody Burton joins State Superintendent of Public Instruction Dr. Jennifer McCormick at the Statehouse on Tuesday, June 12, 2018, to recognize Whiteland Community High School for having 25 percent or more of their graduating class earn a score of 3 out of 5 on at least one AP exam. Pictured left to right: McCormick, Clark-Pleasant Community Schools Superintendent Dr. Patrick Spray; Brian Lukich, math teacher; Whiteland Community High School Principal Tom Zobel; Burton; and Dave McMillan, counselor. In Indiana, there are nearly twice as many children in the foster care system than there are available foster homes. In 2017, more than 23,000 Hoosier children were in need of a foster home. Almost 60 percent of all kids that enter the child welfare system are under 6 years old, and many leave home with only the clothes on their backs or what can fit into a trash bag. These staggering statistics are heart wrenching. They highlight the need for a more streamlined adoption process and foster care program in Indiana. At any given time, there are 75 to 100 children in the Department of Child Service’s database waiting to be adopted. Appreciating the growing demands placed on the system, state lawmakers and the Holcomb Administration increased DCS funding nearly $600 million during the current two-year budget cycle. Since the start of the New Year, a highly-respected national firm is performing a top-to-bottom audit of DCS procedures and policies. While I eagerly await their findings and recommendations this spring, I have already been working to improve efficiency and transparency within Indiana’s adoption and foster care systems. This session, my goal is to create measures that ensure and accelerate the placement of children in safe and loving homes. With my legislation, I hope to provide a clear process and guidelines for those involved in foster care and adoption. While often a thankless job, fostering or adopting a child is a rewarding experience. I respect anyone who is considering or currently participating in this process. You are needed! This issue is very near and dear to my heart. As a child, my father frequently abused my mother, siblings and me. When my mother tried to stop him, he would knock her unconscious. It wasn’t until my mother threatened to kill my father that she was granted a restraining order. One night, while we were staying with my grandmother, my father barged in and forced my mom to leave with him at gun point. I remember waking up in the back of a police car, not knowing what was going on and then being taken to a group home where I was separated from my brother and sister. Eventually, my mother was able to escape and come back to us. That was more than 60 years ago, but I still remember vividly how terrified I was as a child. I experienced the same confusion and emotions similar to what children in foster care experience today, and I want to ensure that no child has to go through what I went through. Over the last few months, I have been meeting with adoptive and foster families, DCS officials, the governor and his staff, and other lawmakers to find the best solution for kids. I want to hear from Hoosiers about their experiences with the Indiana foster program and adoption process. You can share your story with me at h58@iga.in.gov or 317-232-9648. State Rep. Woody Burton will host two town hall meetings next week to share information about the 2018 legislative session. Those unable to attend can contact Burton with questions by emailing h58@iga.in.gov or calling 317-232-9648. The 2018 legislative session begins Wednesday, Jan. 3. State Rep. Woody Burton is hosting a listening forum to hear local Hoosiers’ experiences with Indiana’s foster care system and adoption process. Burton said he plans to introduce legislation during the 2018 legislative session to make the process of fostering or adopting a child more transparent and efficient in Indiana. The forum is open to the public and will be from 5:30-7:30 p.m. on Thursday, Nov. 30, at the Johnson County Public Library-White River Branch. Those unable to attend can share their experience with Burton by emailing h58@iga.in.gov or calling 317-232-9648.